Home → Rochdale AFC → A picture says a thousand words! 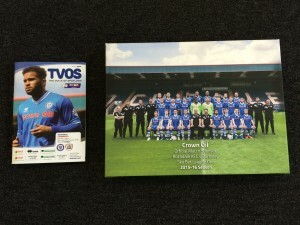 After our fantastic day out watching The Dale, not only did they gift us and the fans to a 3-0 victory over mid-table Barnsley, but we were also kindly presented with a team picture and a matchday programme too! The team have done wonders this season and the recent 3 points have pushed The Dale into an incredible 6th place in the league. As joint matchday sponsors, we were given a warm welcome, treated to a great display of football and the office now looks like it’s had a makeover with this great team picture! 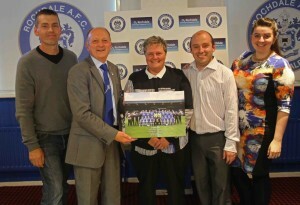 So here’s a big thank you to everyone at Rochdale AFC from all at Crown Oil! We wish you the best of luck for the rest of the season! Here at Crown Oil, we’re proud to support and sponsor The Dale, as well as many other hard working businesses across the North West and across the rest of the UK. We’ve been helping and supporting businesses of all sizes in every industry for over 70 years, by supplying them with a range of fuels, oils and lubricants. Although we’re based in Greater Manchester, over the years we’ve expanded our reach across the UK and now have oil depots located across the UK, all capable of supplying our range of fuels, oils and lubricants within 24-48 hours. For more urgent requirements, we can also ensure an emergency delivery is dispatched on the same day! If you’d like to call and discuss your requirements with our friendly team (you don’t need to be a Dale supporter! ), then you can do so by giving us a call today on 0845 313 0845 and we’ll see how we can best help you.